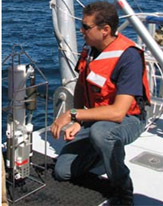 In 2007, collaborators from the Stellwagen Bank National Marine Sanctuary (SBNMS), the Northeast Fisheries Science Center, Cornell Laboratory of Ornithology's Bioacoustics Research Program (BRP) and Marine Acoustics, Inc. (a private company based in Rhode Island) began a three-year project continuing efforts to characterize the underwater acoustic environment of the sanctuary and further examining the effects of noise on resident marine animals. Arrays of marine autonomous recording units (MARUs) are deployed in the sanctuary to continuously record low-frequency underwater sound (10 to 1000 Hz). Further collaborations with the US Coast Guard's Research and Development Center and the University of New Hampshire’s Center for Coastal and Ocean Mapping enable continuous tracking of all large vessel traffic within and around the Sanctuary using the US Coast Guard’s Automated Identification System (AIS). Additional datasets are used to track or estimate the distributions and densities of small and medium-sized vessels. Acoustic data are combined with vessel tracking data to examine aspects of individual vessel source signatures (i.e., variance with speed, directivity of sound etc.) and estimate the relative contributions of different types of vessels to the total "noise budget" of the Sanctuary. Distribution of AIS-tracked large commercial vessels transiting the study area during a single month. The locations of the bottom-mounted MARUs that were recording during this period (yellow dots) and SBNMS boundaries (white) are also indicated. MARUs are also being used to detect, locate and track vocalizing marine mammals such as North Atlantic right whales, humpback whales, fin whales and fish species such as cod and haddock. These analyses rely heavily on software developed by and available through BRP. Information from MARUs regarding the acoustic behaviors of vocally-active whales and fish in the SBNMS (i.e., distribution and density of calling activity, calling rates among acoustically-detected groups, source levels of calls) as well as information from ongoing whale tagging efforts in and around the Sanctuary (i.e. calling depths, individual-based calling contexts) are being used to better understand how marine animals use sound. 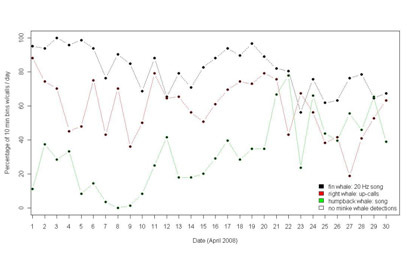 The percentages of 10-minute bins per day throughout a month of sampling in which North Atlantic fin, right, and humpback whales were acoustically detected on a single MARU within the array. No minke whale calls were detected during this month. Received levels from MARUs are also related to wind speeds recorded by two oceanographic buoys in Massachusetts Bay (GMOOS A01 and NDBC 44013) in order to estimate wind-generated noise throughout the study area. Average hourly wind-speeds (meters/second) recorded on two nearby oceanographic buoys and 95th (bottom 5%) received level percentiles for six single frequencies and one broad bandwidth recorded on an MARU in the SBNMS array. Estimates of received levels produced by calling whales and fish, wind and shipping are summed and animated to produce empirically-based visualizations of spatial and temporal variance in noise levels throughout the Sanctuary and surrounding waters. 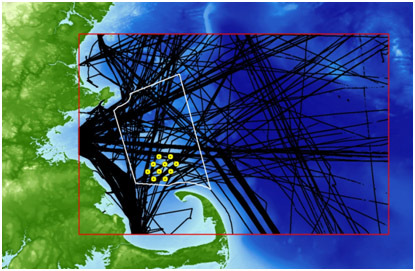 An example of predicted received levels (71-224 Hz, dB re 1μPa, scale far right) produced by calling right whales, large commercial ships and wind-dependent background noise within the study area (boundaries of the SBNMS outlined in black) calculated every 10-min over a 9-hr period. These integrative analyses rely heavily on accurate modeling of sound propagation throughout the study area, which varies among source types, as well as with depth, bottom type, water pressure, water temperature and water salinity (among other factors). To inform sound propagation modeling in the study area, oceanographic data are collected by CTD during MARU deployment and retrieval and field experiments are conducted to measure and more accurately model sound transmission loss within the array area. Michael Thompson (SBNMS, left) deploying Seabird SBE 19 CTD to collect data to inform sound velocity measurements in the sanctuary. 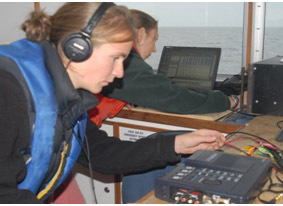 Denise Risch and Danielle Cholewiak (NEFSC, right) conducting sound transmission loss experiment on board the R/V Auk. Example of sound propagation over distance for a transmission at 394 Hz. 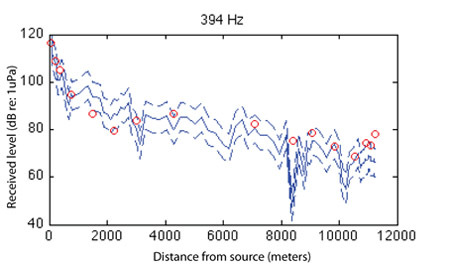 Data represent empirical received levels (red dots) as measured during field experiment and predicted received levels (solid blue line) using the Bellhop sound propagation model. Dashed lines indicate ± 6dB. Spatial and temporal variation in the “signal excess” of calling whales relative to estimates of present day and historical background noise conditions are calculated as detailed in a recent publication emerging from this work (Clark et al. 2009, see below). 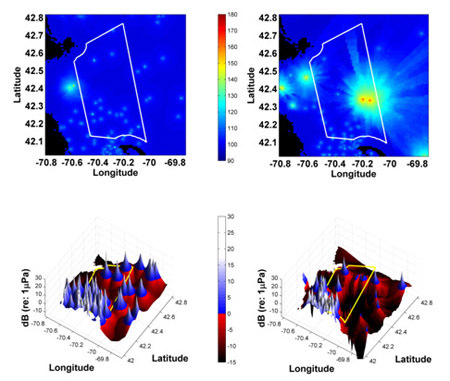 Spatial distributions of summed received levels (top panels) and signal excess (bottom) for upcalling North Atlantic right whales relative to noise from discrete AIS-identified ships (71-224 Hz, RMS re 1 µPa) during two 10-minute samples selected to represent quieter (left) and noisier (right) samples. Under quieter conditions, the area within which calls produced by whales can be heard above background noise (positive signal excess, blue-white bottom left) is significantly greater than under noisier conditions (diminished blue-white area, bottom right). Right whale communication masking index calculated every 10-minutes for a month, where 0 indicates no masking relative to historic levels and 1 indicates 100% masking as a result of modern-day levels of noise in the study area. These calculations suggest significant loss of communication capabilities for right whales in the SBNMS. This project represents a high-level, integrative ‘bench mark’ study aimed at characterizing the marine acoustic environment and the health of an urbanized, highly productive ecosystem: the SBNMS. The primary products of the project are a suite of tools intentionally designed to be transferable to other ecological regions or Sanctuaries as well as an extensive database specific to the project. 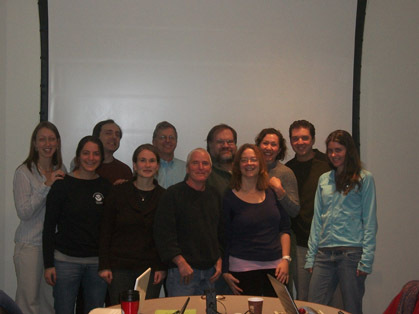 The project’s database is built and managed to promote interfacing with other oceanographic datasets (including OBIS SEAMAP, and the Whale Habitat Informatics Project (WHIP)) and methods to display results are developed to be useful and accessible in a variety of education and outreach contexts. This research is supported by the National Oceanographic Partnership Program (2007-2010) and by Exxon Mobil Corporation via the National Fish and Wildlife Foundation (2010-2011). Going Green Boston, WCVBTV/DT Channel 5 Boston, "Noise Pollution Hurting Marine Wildlife: Noise Can Interfere With Animals' Communication", original air date September 9 2008. Science Magazine, Special Issues Changing Oceans, “A Push for Quieter Ships”, David Malakoff, Science 18 June 2010: 1502-1503.